Local and regional governments across the world are working to become more transparent and accountable than ever before. We're making budget, procurement and policy-making decisions public. We're implementing new codes of ethics for elected and appointed officials. We're introducing oversight to tackle corruption. We're allowing citizens to access and re-use public information by harnessing the power of open data. We're also exchanging experiences at national and international level so that we can learn from one another's successes. Strong institutions are open, democratic institutions, capable of listening to citizens and responding to local concerns and priorities. We'll discuss these challenges at the UCLG Congress in Bogotá in a Policy Dialogue on "Stronger, More Accountable Local and Regional Governments" on 12 October. Confirmed panelists so far include Mayor of Dakar, Khalifa Sall, Mayor of Diyarbakır, Gültan Kışanak, and Director of the UN Millennium Campaign, Mitchell Toomey. Of course, effective local governance is impossible without appropriate powers and resources. 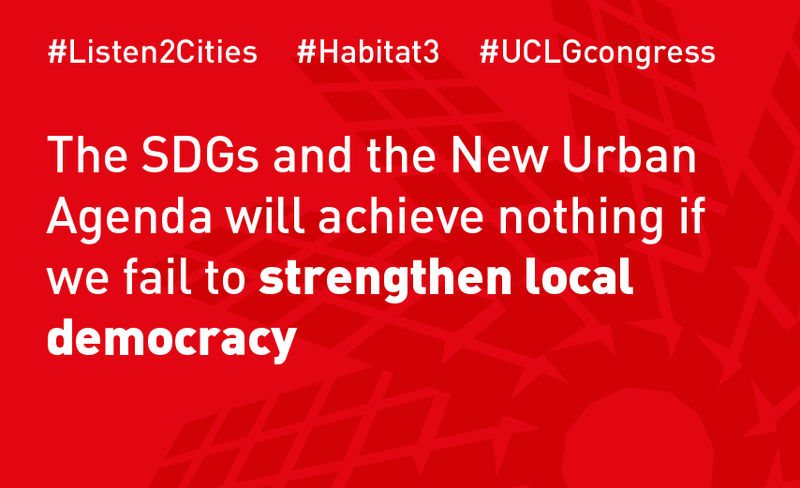 That's why UCLG and the Global Taskforce are calling for Habitat III to strengthen local and regional governments through decentralization, capacity building, and investment and financing.